I don’t like shared hosting, why? It’s either slow at time for hours or always slow, so instead I just grab a VPS and pay the $30 or $50 month so my sites load fast. You could even ditch your Grid Service and go with a Dedicated Virtual, and achieve lighting fast page loads on your WordPress/PHP site. Anyways, lets talk more about how to setup APC properly on the Grid Service. I mean lets really talk about it, because I always forget the steps. I almost forgot, if you want to follow the instructions in this guide. You will need to have SSH access enabled on your Grid Service account. This guide will assist you. Once you have access and the URL to the latest stable release of APC (3.0.19 as of this writing). You will want to wget the file to the root of your account. Decompress and untar the archive, change directory to the extracted contents and phpize the module. Make sure the file has a .php extension and then open up a browser and view the file. You should be presented with something like the following. You can see that we’re running PHP 5.2.14-2, the “-2” is more or less for MediaTemples reference. Next you want to type out the following command and run it, pay special attention to the “-with-php-config” portion as this is important, make sure you find the right location of this file then run the command. A bunch of text should scroll, hopefully no errors. Now we want to make the module so just type “make”. xxxxxxx.com@n10:~/APC-3.0.19$ make /bin/sh /home/xxxxx/users/.home/APC-3.0.19/libtool --mode=compile gcc -I. -I/home/xxxxx/users/.home/APC-3.0.19 -DPHP_ATOM_INC -I/home/xxxxxx/users/.home/APC-3.0.19/include -I/home/113041/users/.home/APC-3.0.19/main -I/home/xxxxxx/users/.home/APC-3.0.19 -I/usr/local/php-5.2.14-2/include/php -I/usr/local/php-5.2.14-2/include/php/main -I/usr/local/php-5.2.14-2/include/php/TSRM -I/usr/local/php-5.2.14-2/include/php/Zend -I/usr/local/php-5.2.14-2/include/php/ext -I/usr/local/php-5.2.14-2/include/php/ext/date/lib -DHAVE_CONFIG_H -g -O2 -c /home/xxxxxx/users/.home/APC-3.0.19/apc.c -o apc.lo -------------CUT TO SAVE SPACE-------------- ---------------------------------------------------------------------- Libraries have been installed in: /home/xxxxx/users/.home/APC-3.0.19/modules If you ever happen to want to link against installed libraries in a given directory, LIBDIR, you must either use libtool, and specify the full pathname of the library, or use the `-LLIBDIR' flag during linking and do at least one of the following: - add LIBDIR to the `LD_LIBRARY_PATH' environment variable during execution - add LIBDIR to the `LD_RUN_PATH' environment variable during linking - use the `-Wl,--rpath -Wl,LIBDIR' linker flag - have your system administrator add LIBDIR to `/etc/ld.so.conf' See any operating system documentation about shared libraries for more information, such as the ld(1) and ld.so(8) manual pages. ---------------------------------------------------------------------- Build complete. (It is safe to ignore warnings about tempnam and tmpnam). Now we just need to make the appropriate directories for the module to reside. The directory you need to find is called “data”, if you follow these steps below you can navigate to the directory. Then make the proper directories, and then copy the module. You should now have APC loaded into PHP, double check by going to the phpinfo page you made and search for APC. It should give you some information and configuration variables. Furthermore, if APC is not being loaded and shown on the phpinfo page, enable the error log (http://wiki.mediatemple.net/w/GS:Read_access_logs_and_error_logs) and see if any error messages are being generated. Thanks for the mention and the how-to on APC setup. We always enjoy seeing reviews and articles that deal with troubleshooting issues. You are not only informing our customers, but you are also giving us insight on what we need to work on improving. Let us know if you have any further questions our comments regarding our services. Just tried this with a pretty fresh (gs) account and there wasn’t any php config in the /usr/local/php-5.2.14/ directory. However, /user/local/php5/bin/php-config worked, and I successfully enabled APC after using that config directory for ./configure. Hey Mathew, sorry about the late response. I didn’t know your comments were queue’d for moderation. Yea, I noticed lots of articles related to find the config to vary. I notice at times there are different configs on the server, and people will need to manually need to find the config at times. I confirmed the following by logging into my gs account today. Jordan, thanks again for posting this tutorial. Due to the design of the (gs) Grid-Service, each visitor to your site is potentially accessing a different node with each site request. APC is not recommended on (gs) Grid-Service sites since each node in the grid would be have its own unique APC cache; basically, APC cannot function as normally expected when it is enabled on a (gs) Grid-Service site, and its use, while possible, will not offer any benefit. So does that mean we dont have to install APC at all since it is already turned on? And you cant specific which node you use? It would be great to confirm what they’re saying, I’d rather go with proof than what their Technical Support staff regurgitates (not knocking them, yet…). I don’t use MediaTemple, I’ve noticed odd and strange slow downs not from PHP but generally from their Web Servers responding to GET requests. I do have a clients account that is running WordPress with APC installed. However I’ve also setup WP Super Cache which turns all PHP pages on the site into generated HTML for even quicker load times on static pages. I put up the apc.php page for checking the status on APC and its cache and noticed that the node in-fact did change, but it seemed to only change after about 5 minutes. So it look as though they’re correct, and you will not see a huge improvement with APC on MediaTemples Grid Service. Which is a shame because you’re probably going to get faster load times on pages with APC than distributing the load across nodes. But unless its tested its just my theory and I could be completely wrong. 1. Node A responds and caches the page. 2. Node B responds. The page is in A’s cache, but B can’t access it. B must cache its own copy. 3. Node A responds. Node A has the page in its cache, so uses it. Thus, though APC will provide benefits for requests served by a single node, it won’t help across nodes. This is really outside of my zone of experience -doing this install. I would be fearful of messing something up. So quick question – if I use w3 Total Cache plugin instead, would that provide as good performance increase in speed? I understand if you can’t answer this. You will notice a difference, however you should still setup a PHP opcode cacher like APC or Xcache for any PHP portions that run. is this normal, or do i need to type something different with the current version of mediaTemple gridServer (gs)? 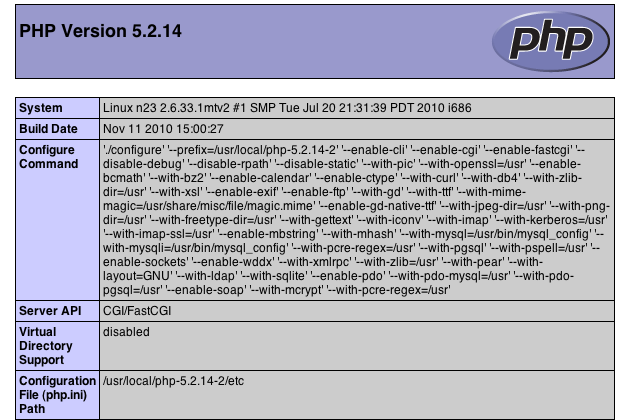 it looks like its installed, it shows up under php configuration in phpinfo. If its displaying under phpinfo, and you don’t get any error messages in your phplog. Then you’re good to go. Can anyone confirm if they have managed to get this working on the new GS (post-summer 2013)? I have been unable to install APC on the new Grid. I haven’t had access to a new Grid Service account yet, sorry.